The heat hasn’t let up, so we hope you’ve been enjoying our summer six pack beer recommendations. However, you happen to prefer cocktails to beer, you’re in luck! 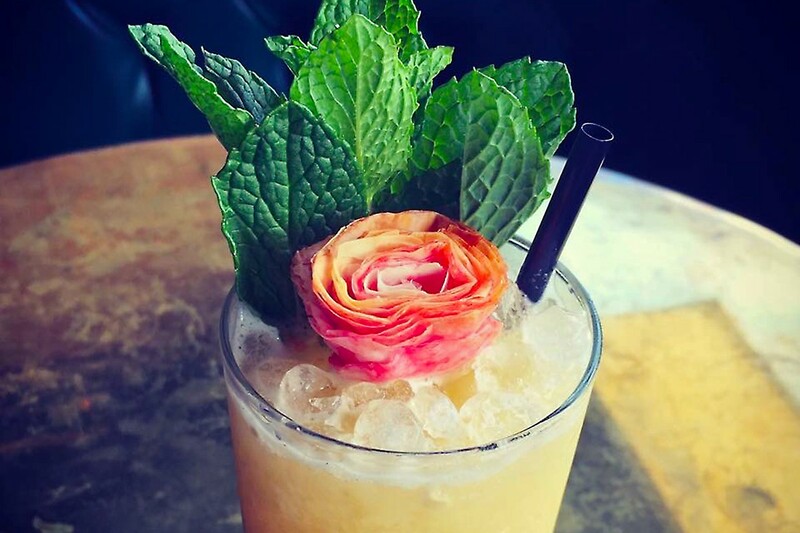 We scoured the city and came up with 10 of the best cocktails for this time of year. What makes a great summer cocktail? 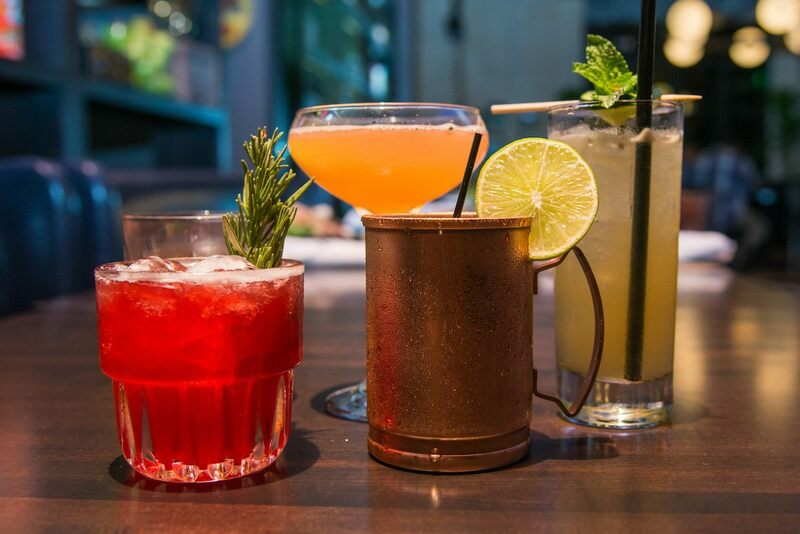 According to Michelle Womack, bar manager at Pax Americana, the drink should be “refreshing and easy to drink without sacrificing any of the booze.” With that in mind, here are cocktails that Houstonians should cool off with the rest of this searing hot summer (which we all know is going to go on through September). Fhloston Paradise at Anvil Bar & Refuge, 1424 Westheimer: Anvil is the undisputed OG of Houston’s cocktail scene. It boasts well over 100 cocktails on its menu year round, so there’s guaranteed to be something for everyone. Additionally, Anvil just added seven cocktails to their summer cocktail menu. Try the Fhloston Paradise, a combination of Plantation 3 Star White Rum, Plantation Dark Rum, sherry, pineapple, pistachio and ginger. That the name comes from cult sci-fi classic The Fifth Element makes it even cooler. One multipass to Anvil, please. A few of The General Public’s cocktails. Photo courtesy of The General Public. Mezcal Mule at The General Public, 797 Sorella: Tucked away in the southwest portion of CityCentre, General Public is a bit of a hidden gem, but it is home to fantastic cocktails and an even better happy hour special. The Mezcal Mule (pictured above) combines Del Maguey Vida mezcal, blackberries, lime and ginger beer into one of the more craveable mules we’ve had. Add to that a “scalable” happy hour Mondays through Fridays from 4 to 6 p.m. The way it works is the entire drink menu is $4 at 4 p.m., $5 at 5 p.m. and so on. Adding to that a $5 house burger makes General Public a strong contender for best happy hour on the west side. Ladybirds’ Lady Love cocktail. Photo by Meredith Richey. 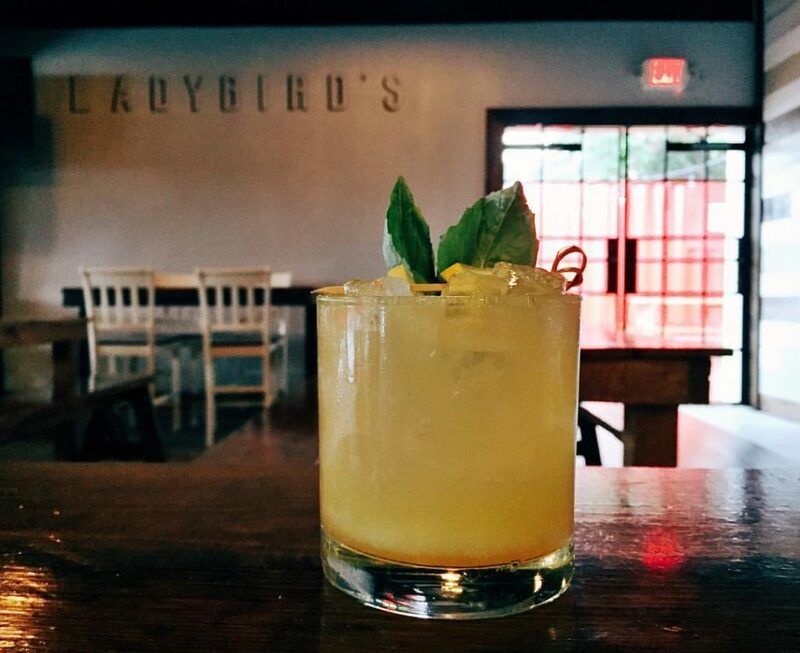 Lady Love at Ladybirds, 5519 Allen: The cocktail list at this family-owned establishment is full of high-quality drinks that are absolute steals, even at the $9 to $10 price point. 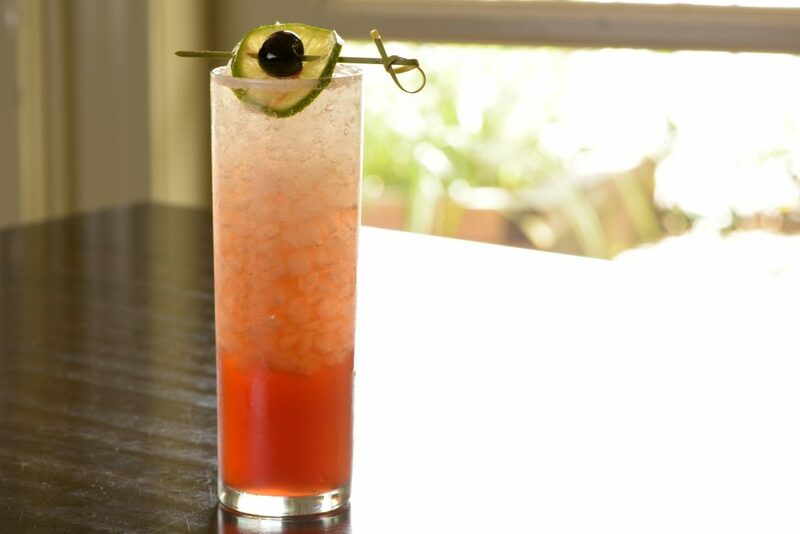 We recommend the Lady Love, comprised of gin, passion fruit, lemon and lillet (an oak-aged, French blended wine). It’s difficult to choose just one cocktail at Ladybirds. Names like “Lady Melon Cooler” and “Caribbean Bird” conjure up tempting images of being on a beach on a sunny day. 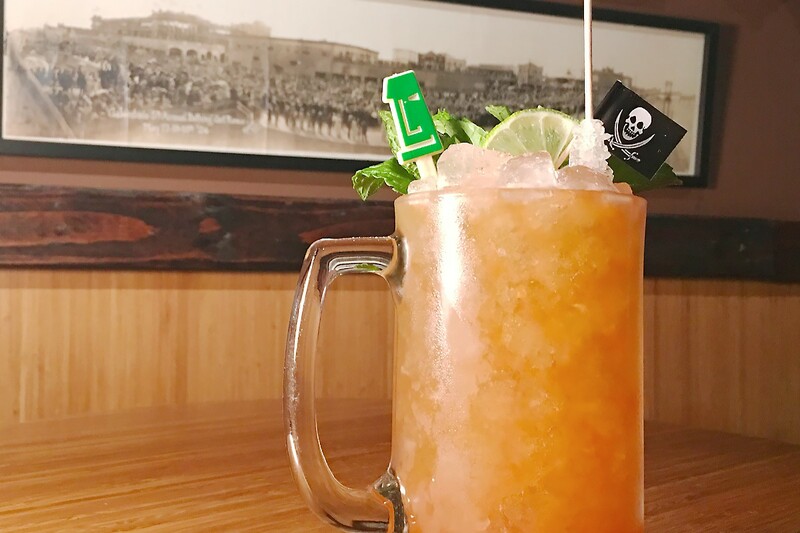 Navy Grog at Lei Low Rum & Tiki Bar, 6412 Main: Lei Low has been bringing the tiki lifestyle to The Heights for a few years now and doesn’t show any sign of slowing down. Try the Navy Grog, a mix of Navy Rum, honey, guava, lime and nutmeg. The serving vessels make for Instagram-worthy drinks, with customers posting plenty of photos of tiki heads, fishbowls and large shark mugs on social media. Parking can be tight, so we recommend arriving early. Eternal Sunshine at Moving Sidewalk, 306 Main: This downtown joint combines Caravedo Pisco, grapefruit, strawberry and pineapple to create Eternal Sunshine in cocktail form. Pisco, Peru’s national spirit, is well-balanced with notes of dried fruits, grapes and caramel. Adding sweetness from the fruit juice might sound a bit overpowering, but the talented staff spends countless hours obsessing over every aspect of their creations in their back-of-house kitchen, where every ingredient is made—other than the spirits, of course. Knockout at Nobie’s, 2048 Colquitt: Bar manager Sarah Troxell is known for her creative cocktails on Nobie’s menu. The list changes often, so we recommend trying the Knockout while it’s available. A house rum blend, Pimento Dram, grapefruit, lime, angostura bitters and Topo Chico meld perfectly to create a citrusy and easy-sipping cocktail. Don’t let the Pimento Dram scare you. It has nothing to do with cheese. It’s actually a peppery liqueur. The Sonic Boom cocktail. Photo courtesy of The PR Boutique. Sonic Boom at Pax Americana, 4319 Montrose: The Sonic Boom cocktail is made up of Old Forester bourbon, Cherry Heering, lime cordial and is topped with Topo Chico for a tongue-tingling kick of carbonation. It’s poured over (and named after) what Womack calls the “best ice, ever!”—the pellet-shaped or “Sonic” ice made popular by the drive-in fast food chain. Southern Gin Gimlet at Perry’s Steakhouse & Grille, various locations: The Southern Gin Gimlet uses San Antonio’s Seersucker Gin, lime, simple syrup, cucumber and basil. Seersucker Gin uses fewer botanicals than some competitors, which makes for an easy-drinking spirit that even non-gin drinkers will enjoy. Seasons 52 just launched an excellent seasonal cocktail menu that includes a Bourbon Peach Smash. Photo courtesy of Seasons 52. 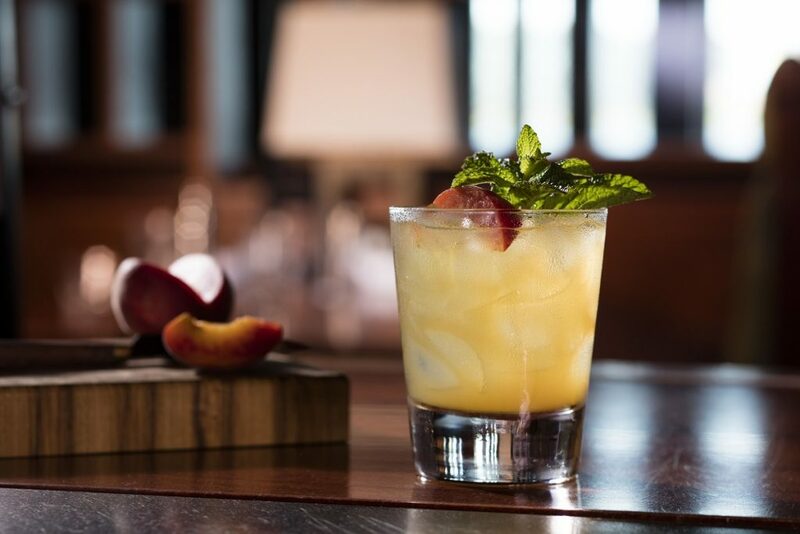 Bourbon Peach Smash at Seasons 52, various locations: The Bourbon Peach Smash combines Makers Mark bourbon, peach nectar, gently slapped mint and a peach wedge to create a whiskey-forward beverage that’s not overly sweet. Slapping the mint sprig before adding it to the cocktail slightly warms the mint and extracts the oils. That small but important step results in a cooling aroma that patrons can smell even before the drink is served. Afternoon Tea at Weights + Measures, 2808 Caroline: Is there anything on a hot day that sounds better than a nice, cold glass of iced tea? Weights + Measures’ Afternoon Tea just might be an improvement on the classic. Additions of chamomile and strawberry builds and improves upon the classic tequila, orange liquor and grapefruit trio that’s a cornerstone of many classic cocktails. The addition of tea and the acidity of the strawberry balance the tequila nicely.